The count method to determine the heart frequency. The second QRS complex is between 75 and 60 beat per minute. This heartbeat is between that, around 65 beats per minute. What is the heart rate? To answer this question, determine the time between two QRS complexes. Previously, the ECG was printed on a paper strip transported through an ECG writer at the speed of 25 mm/second. Now, digital ECGs are common; however, the method for determining the frequency remains the same. 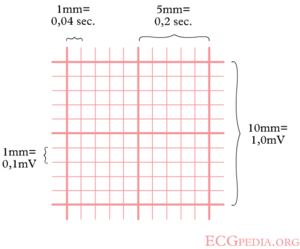 The ECG has a grid with thick lines 5 mm apart (= 0,20 second) and thin lines 1 mm (0,04 second). The square counting method is ideal for regular heart rates. Use the sequence 300-150-100-75-60-50-43-37. Count from the first QRS complex, the first thick line is 300, the next thick line 150 etc. Stop the sequence at the next QRS complex. When the second QRS complex is between two lines, take the mean of the two numbers from the sequence or use the fine-tuning method listed below. Non-regular rhythms are best determined with the "3 second marker method". Count the number of QRS complexes that fit into 3 seconds (some ECG writers print this period on the ECG paper). Multiply this number by 20 to find the number of beats/minute. What changes the frequency of the heart? the (para) sympathic nervous system. The parasympathic system (nervus vagus,) e.g. acetycholine, decreases the frequency and atrioventricular conduction. The parasympathic system affects mainly the atria. Cardiac filling increases the frequency. This page was last edited on 15 March 2011, at 19:51.